Wash strawberries and pat dry and put in a large glass or bowl. Pour rosé over the strawberries until they are all covered. Cover with plastic wrap and let sit in the fridge for 24 hours. Remove strawberries and dry fully with paper towels. Make sure they are completely dry on the outside or the candy will seize up and ruin the smooth consistency. Melt candy according to package directions. Add vegetable shortening or oil to get a velvety smooth and thin consistency, perfect for dipping. Pour candy into a deep mug or cup. Hold the strawberries at the stem and dip into melted chocolate until it is fully coated. Pull straight up and out of the melted candy. Use your free hand to tap the wrist of the hand holding the strawberry to help the excess candy slide off and back into your cup. Place onto wax paper. Add sprinkles or gold stars if desired and let dry fully, until candy has set (speed up the process by placing in the fridge or freezer for a few minutes). 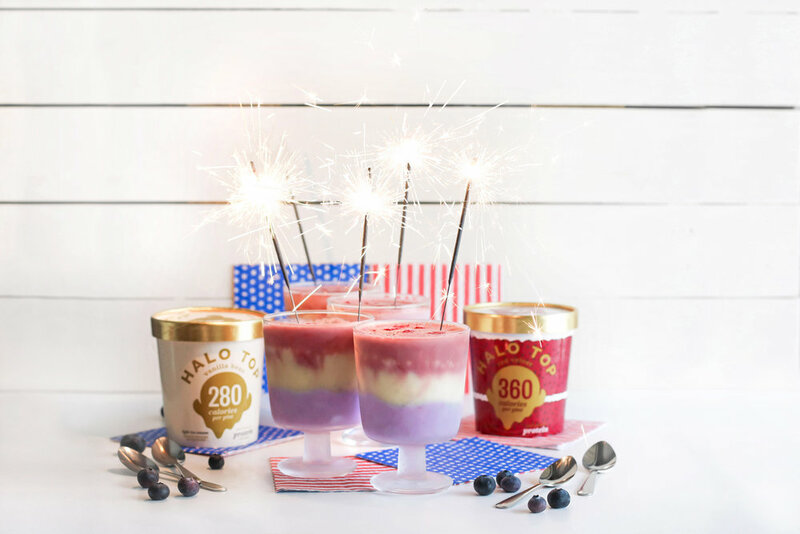 Enjoy with Vanilla Bean Halo Top ice cream the same day, or refrigerate if not serving immediately. These are best served within 24 hours of dipping. Place Black Cherry Halo Top, rosé wine, rose water, lemon juice, and ice into a blender. Blend mixture on high until smooth. Pour into glasses and garnish with rose petals, if desired. Place a silicone donut pan on top of a baking sheet and place in the freezer to chill for 1 hour. 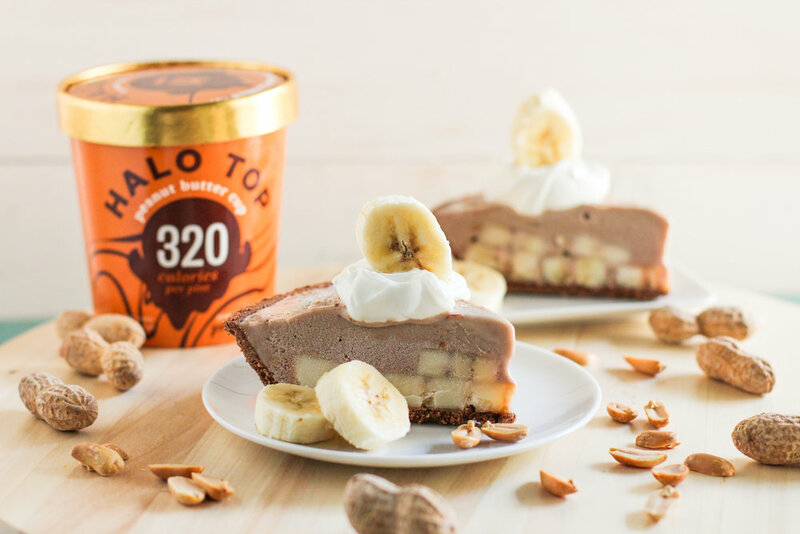 Scoop the softened Halo Top inside the pan and spread it out. Place the sliced strawberries over half of the donuts. Place the pan in the freezer for 4 hours. Working quickly, carefully remove the ice cream donuts out of the silicone mold and onto the chilled baking sheet. You can place a sheet of parchment paper down to keep it clean. Press two donut halves together to form a full donut, and repeat this with the remaining donut halves. Place back in the freezer. In a deep, microwave-safe bowl, add the dark chocolate. Microwave at 30-second intervals, stirring between each one, until completely melted. Stir in 2 tablespoons of the coconut oil. Working quickly, dunk a donut in the chocolate and flip over to coat completely. Quickly remove the donut using forks on either side and place back on the chilled baking sheet. Repeat this with the remaining donuts. Place back in the freezer for 2 hours. In a small, microwave-safe bowl, add the white chocolate. Microwave at 20-second intervals, stirring between each one, until completely melted. Stir in the remaining coconut oil. Drizzle over the donuts. Preheat the oven to 400 degrees Fahrenheit and spray a muffin tin with cooking spray. Let the puff pastry sheets thaw at room temperature for 20 minutes, or until you can unroll them without tearing. Use a rolling pin to roll out one sheet. Slice the sheet into 6 strips. Use a 2½” circle cookie cutter to punch circles out of the other puff pastry sheet. In another small bowl, whisk together the sugar and cinnamon. Brush the pastry strips and circles with the egg, then sprinkle with the cinnamon sugar. Line the muffin tin walls with the puff pastry strips, then press the circles on the bottom of the lined tins. Bake for 19 minutes, or until golden brown. Let cool completely. 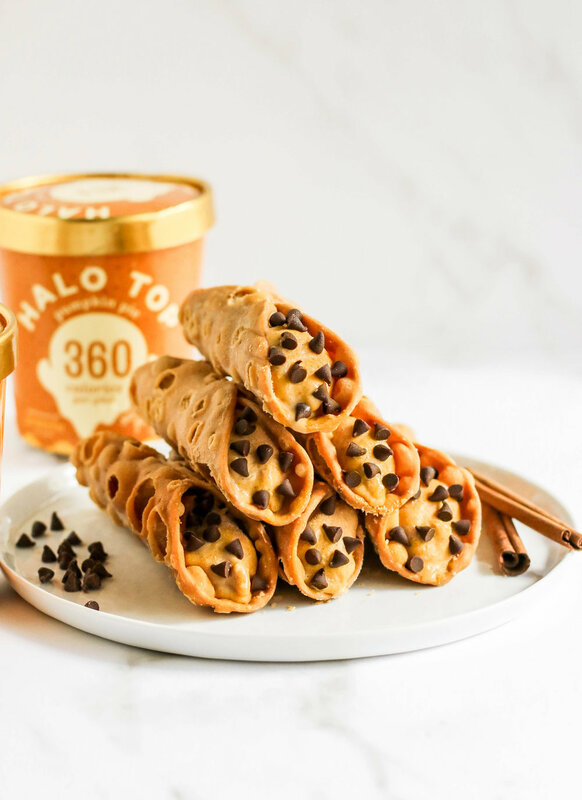 Scoop the softened Halo Top over the cooled puff pastry bowls. Serve immediately. Enjoy! Line a 6” springform pan with parchment paper by lining the base with parchment and tightening the springform on top so that the paper stays in place. In a large bowl, stir together the rice cereal and melted chocolate. Scoop the mixture into the springform pan, spread it out, then tap the pan on the counter a few times to help level it. Refrigerate for 30 minutes. Scoop the softened Halo Top over the crunch base and spread it out into an even layer. Freeze for 2+ hours. Slice into 10 slices and top each slice with an Oreo chopped in half. Enjoy! Line an 8x5” loaf pan with plastic wrap. 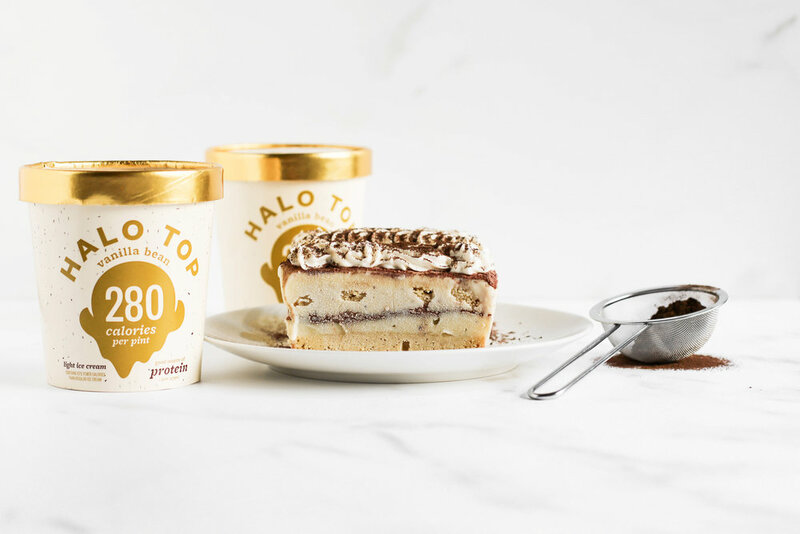 Scoop the softened Halo Top inside the pan and spread it out. Place the pan in the freezer. In a large bowl, whisk together the milk and pudding mix until smooth and pudding-like (about 2 minutes). Add the whipped topping and fold together until the mixture is completely even. Scoop the mixture over the ice cream layer. Sprinkle the chopped peanuts on top. Cover and freeze overnight. Remove the pan from the freezer about 10 minutes before serving. Invert the pan and peel off the plastic wrap. Slice and serve with a chocolate shell (or melted dark chocolate), caramel sauce, and extra chopped peanuts. Enjoy! In a large microwave-safe bowl, add the coconut oil. Microwave at 15-second intervals, stirring between each one, until melted. Add the eggs, sugar, water, and vanilla extract. Whisk until completely even. Place a fine mesh sieve over the bowl. Add the coconut flour, cocoa powder, baking powder, and salt. Sift over the wet ingredients and whisk together until completely combined. Use a small cookie scoop to scoop the batter onto the prepared pan. Tap the pan on the counter a few times to let the scoops round out. Bake for 10-11 minutes, or until the surface of the whoopies spring back when tapped. Let cool, then place in the freezer to chill for 2 hours. Let the pint of Halo Top thaw on the counter for 15 minutes. Scoop the ice cream onto half of the frozen whoopies and sandwich the remaining whoopies on top. Freeze for 1 hour. Feel free to drizzle melted white chocolate (or dark chocolate) over the whoopies and sprinkle with gingerbread cookie or graham cracker crumbs! Serve immediately and enjoy! Place 6 small trifle cups on a cookie sheet and reserve space in your freezer for the tray. For the Blue Layer- In a bowl, stir together the blueberry preserves and thawed frozen whipped topping. Evenly spoon the mixture into the cups. Place the tray in the freezer for 2 hours. Sprinkle 1 tablespoon of crumbled waffle cones into each cup. For the White Layer- Evenly spoon the softened Halo Top into the jars. Sprinkle 1 tablespoon of crumbled waffle cones into each cup. Place tray in the freezer for 1 hour. For the Red Layer- Scoop the Halo Top into a bowl and stir in the diced strawberries. Spoon the mixture into the jars. Place tray in the freezer for 1 hour. Serve with frozen whipped topping, a drizzle of melted chocolate, fresh strawberries and blueberries, or spoons alone. Enjoy! Add the eggs, melted butter, maple syrup, and vanilla extract. Whisk until smooth. Scoop batter into the pan and spread it out. Bake for 30 minutes, or until the edges have browned slightly and the center springs back when tapped. Flip cake onto a wire cooling rack and let cool completely. Line the loaf pan with plastic wrap and bring out the pint of Halo Top to soften. Scoop the softened Halo Top inside the pan and spread it out. Freeze for 2 hours. Place the cooled cake over the ice cream layer. Cover and freeze overnight. Invert the pan and peel off the plastic wrap. Slice the cake. When the ice cream begins to melt and soak into the cake, serve immediately. Enjoy!